Cuzco the goat recently campaigned for Homecoming King at Houghton College. His campaign was very successful even though he did not recieve the crown. Cuzco feels that his campaign brought greater awareness to the campus about Homecoming elections, and suspects that Houghton is a better place because of his efforts. 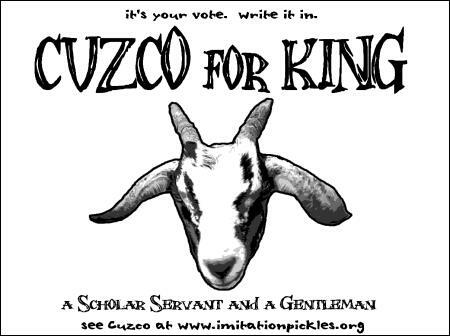 Cuzco's election took place on September 27th, 2002 in the Campus Center at Houghton College. He appreciated the overwhelmingly positive respose he recieved. If you want to see more pictures of Cuzco, you can also check out Cuzco's Goat Shrine.